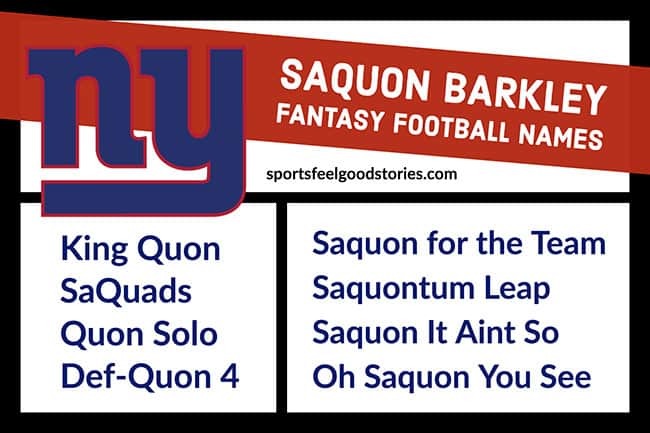 You’ll enjoy these exciting and unique Saquon Barkley Fantasy Football Names. Barkley’s professional career got off to a fast start when he scored his first NFL touchdown on a 68-yard rush in the first game of the season. New York Giants’ fans hope the high-impact ability of Quon will energize the team to reach new heights. Barkleying up the wrong tree. The New York Football Giants chose Saquon Barkley in the first round of the 2018 NFL Draft (the 2nd pick overall). A talent for boxing runs in the Saquon family tree. His father Alibay Barkley was an amateur boxer and his great uncle Iran Barkley won the WBC middleweight championship in 1988. Barkley grew up in New York and followed the New York Jets. His favorite player was the Jets’ running back Curtis Martin (My Favorite Martin was a good fantasy name for him). March 14 is designated “Saquon Barkley Day” in Pennsylvania. He was honored with a parade featuring the Whitehall High School marching band and kids from his old youth football league. Another Bark in the Wall. It Saqoun To Know One. Check out all the Giants fantasy name ideas. Barkley attended and played football at Whitehall High School in Whitehall Township, Pennsylvania. He rushed for 3,646 yards and scored 63 touchdowns in his final three years in high school. The four-star recruit decided to play football at Penn State University after turning down a previous commitment to Rutgers. In his three years at Penn State, he ran for 3,843 yards with 43 rushing touchdowns. An accomplished receiver, he also netted 1,195 yards through the air with 8 receiving touchdowns. He broke several Penn State team records, including most rushing touchdowns in a career, most rushing yards by a freshman and sophomore and most total yards in a single game. You might like: Ezekiel Elliot Fantasy Football Names. My Barkley is Louder Than My Bite. You’re on Saquon Barkley Fantasy Football Names.